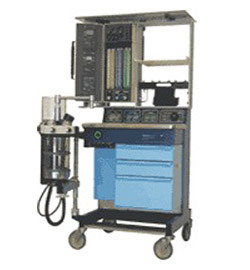 The Ohmeda Modulus II" Anesthesia Machine provides oxygen and volume monitoring and has optional pulse oximetry and endtidal CO2 modules. Choose from a variety of ventilator options: "Ohmeda 7000 "Ohmeda 7800 "DRE AV800 Choose from several different vaporizer options: "Ohmeda Tec Series "Penlon Sigma Delta Series Drawer pack configurations may vary from picture. Features: "Double Flowmeter Tubes (O2 & N2O) "Flowmeter Protection Shield "Link-25 Hypoxic Guard "Touch-Coded Oxygen Knob "Oxygen Supply Pressure Sensor / Alarm "Oxygen Supply Pressure Failure Device "A.C. Line Power Sensor / Alarm "D.C. Power Sensor / Indicator "Selectatec® 3 Vaporizer SM Manifold "Minimum Oxygen Flow "Anti-Disconnect Fresh Gas Outlet "3 Drawer Lockable Cabinet "Integral Footrest "Integrated D.I.S.S. Pipeline Inlets "Modular Oxygen & Nitrous Oxide Yokes "High Pressure Regulator and Gauges "Pneumatic / Electric Interface Main Switch "O2 and N2O (Standard) "Air (Optional) "Hypoxic Guard (Standard) "Oxygen and Volume Monitoring (Standard) "Optional integrated Pulse Oximetry, Endtidal CO2 "GMS CO2 Absorber (Standard) "E-Cylinder and Central Gas Connections (Standard) "Guarded Oxygen Flush "Middle Shelf "
Pod "5400 Volume Monitor "5100 Oxygen Monitor "Electrical Outlet Panel "Oxygen Power Outlet "High-Pressure Hose Hanger "Centralized Patient Interface Panel "Shelf-Mounted Utility Hooks "Anesthetic Bottle Holder "